I have never been to Oman but being a foodie, I love trying out new recipes and learning about food trends all over the world. This book attracted me because of the cover and the blurb that promised lovely new recipes, a fountain of knowledge and some gorgeous photographs. I am so glad I picked this book up to read. I learned so much from it. The recipes are interesting and I know I will trying them out in my kitchen.The photography is vivid, expressive and gorgeous. It relays the food love of the places covered. Add the author's fluid narration style and this book is a must have for all food lovers. The history of the places is also shared in this book which made my reading exprience all the more memorable. 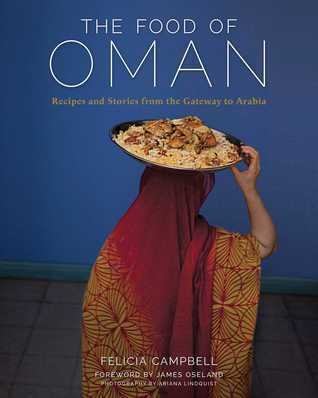 All in all, The Food of Oman: Recipes and Stories from the Gateway to Arabia by Felicia Campbell is a complete package which not only acquaints the readers with the history of the places covered but also takes them on a virtual tour of the places with beautiful pictures, mouth watering recipes and an engaging narration. 4 out of 5 to it from me and recommended to all food lovers.